Things You Should Know about your Pipe Organ. . . Organ technicians tune pipe organs more than they do anything else. Most pipe organs (like pianos) require a tuning at least once a year to sound their best. Depending upon the condition of the organ and the nature of its installation, an organ may need tuning more often. Organ pipes are like a large collection of whistles and party horns, albeit very sophisticated ones. In some organs, the "whistles" can be over 32 feet long and weigh in at well over a ton. Pipes can be made of a variety of substances, usually wood and metal, and they are all hand made -- there is no technology for the mass production of organ pipes. The tuning of a pipe, particularly the "flue" type of pipe (think "whistle" again) is affected by the temperature of the air around and in it. Hotter air is lighter; the molecules are spaced farther apart. Cooler air is heavier; the molecules are closer. So, a pipe has less air in it when it's hot than it does when it's cold, and this affects the pitch of the pipe. When a pipe is tuned at 70 degrees, it will come back to that pitch at which it was tuned every time the temperature comes back to 70 degrees. If, after the pipe is tuned, the temperature increases to 75 degrees, the pitch of the pipe will begin to go sharp. If the temperature cools, it will go flat. This isn't a big problem for organs in environments where the temperature stays within 5 degrees or so of the tuning pitch. It IS a problem if the temperature excursion is greater. This is why most organs installed in "attic" locations (where the roof of the church is also the ceiling of the organ pipe chamber) need to be tuned more often. Seasonally, the temperature fluctuates so much that they won't hold pitch throughout the year, and at the height of summer, or in the dead of winter good tuning is simply impossible. 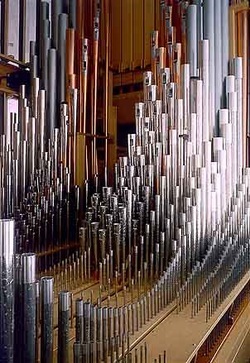 An organ in less than optimal condition, with wind leaks or poorly fitted or damaged tuning slides or pipes can also require frequent tuning. We generally make recommendations for the frequency of tuning based upon the condition of the organ, the pipework and the winding system, and the nature and location of the pipe chambers. Rather than follow a calendar, we try to follow the weather, and begin our tuning regimes when the weather breaks in early Spring or early Fall. And of course, for the high holy days, Easter and Christmas, most music directors want the choir and the organ to both be in their best form, so the weeks before Easter and Christmas are heavy tuning seasons for us. If you need tuning before Easter or Christmas or a special occasion, such as a recital, it's generally best to call us to schedule a date as soon as you can. Our schedule fills up very quickly! 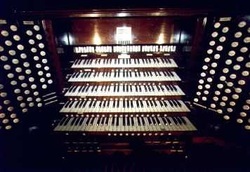 The "console" of the organ is what most people think of when you say "organ". It is actually a control center with stops, tablets, drawknobs, pistons, read-outs and keys and pedals which allows the organist to select what sets of pipes he wants to use, and on what keyboards those pipes will play. Of all the parts of an organ, the console gets the most wear and tear, because although a particular set of pipes might be seldom used, the console, with its stops and keyboards, gets used every time it is played. For this reason, organ consoles will tend to wear out before other parts of the organ do. Keyboard bushings fail and the keys and pedals may start sounding "clacky", stops and pistons may stop working intermittently or finally completely, and the general finish of the organ suffers with layers of masking tape or post-its. When there is a problem with the instrument, it frequently happens in the console or its associated switching and memory mechanisms, which may be mechanical, electro-mechanical or electronic. Our rule of thumb is that a console is usually good for 30 to 40 years with average use, and sometimes less with greater use. Regular maintenance can certainly extend this term, sometimes greatly, but at some point a rebuilding of the console is appropriate. We have done a great number of console rebuilds, including the upgrade of switching systems from electro-mechanical to solid-state. Visit "Our Work" page to see some examples. In the same way that a party horn or a pennywhistle require pressurized air from your lungs in order to play, a pipe organ also relies upon pressurized air to play. This is what we call the "winding" system of the organ (rather than call it pressurized air, organbuilders refer to it as the "wind"). It usually consists of an electrically-powered turbine or squirrel-cage style blower of special design, which feeds a series of bellows, which we call reservoirs or regulators (or "bellows", for that matter). These reservoirs perform the task of accepting and storing wind from the blower , and then providing wind to the windchests at a pre-adjusted pressure level, usually measured in inches or millimeters of displacement in a water column (the water gauge is called a "manometer"). Wind pressures can vary greatly, depending upon the scale of the pipes and the manner of voicing. Some organs play on as low as 2" or wind pressure, although 4" to 5" is much more common. High pressures can be well in excess of 10", and there are even a few stops in the world which are voiced on 100" of wind pressure (and yes, they are ear-splittingly loud at close range -- but they play into a room that seats over 40,000 people). The reservoirs themselves are essentially large boxes with a movable top, which is sealed by a large accordian-fold type of arrangement (see picture). The hinges and corner gussets of this accordian-fold structure are made of leather, although sometimes the hinges may be done with rubber cloth (inadvisable material for gussets). The amount of pressure which the reservoir delivers to the windchest is determined by the adjustment of the valves and usually a combination of springs and weights on the reservoir itself. Absent the intervention of fire, water or rodents, reservoir leather will usually last at least 25 years, and frequently a good deal more than that. Eventually, however, the leather will become brittle and weak, and the reservoir will begin to leak. This creates a good deal of noise, strains the blower, and decreases the amount and pressure of the wind being delivered to the windchest, with the result that the pipes begin to become starved for air, and no longer speak properly. When the first signs of this begin to occur (usually after the first time a hole in a gusset must be patched) , the reservoir should be scheduled for releathering and renewal. The source of wind for the organs of yore was usually a petulant young man enlisted to manually pump the feeder bellows, filling the reservoirs with wind to make the organ play. With the eventual advent of electricity, the young man was freed to seek other pursuits while the wind for the organ was supplied by an electric turbine. Organ blowers come in many shapes and sizes, and generally, the larger the organ, the larger the blower required to provide wind for it, although there are certainly occasional instances of mismatching between organ and blower, with some organs perpetually under-winded, while others have enough blower capacity for an instrument twice the size. During a periodic tuning visit, the organ technician should always check on the performance of the blower, and make sure that it has been properly lubricated, and that it's output connections have no leaks. The location of the blower is of great importance. Some blowers are located inside the organ case itself, usually in a soundproof enclosure (recommended), and some are located some distance from the instrument, in closets, the basement, or sometimes even the attic. 1) Circuit breakers for the blower should be clearly marked, so the blower may be taken off power for maintenance, or in case of an emergency; the electrical code requires a shut-off switch near the blower itself. 2) The blower room itself should be clean of dust and debris as much as possible; the blower intake will generally pull in lighter materials that may be circulating in its vicinity, or in the air. This material can wind up in the organ, and can do harm. In one case, a large blower was placed in the Choir ready-room, with no protection around its motor or intake. Someone moved a rack holding freshly-laundered choir robes (in dry cleaning plastic shrouds) near the intake. The intake pulled in the plastic, shredded it and blew it through the mechanism of the organ, with the result that the organ ciphered incessantly for weeks, and ultimately had to be cleaned out at considerable expense. This stuff happens! 3) Do NOT use the blower room for random storage. Materials which are stored near the blower may be flammable, or may present a danger to the blower itself if they fall over and interfere with the blower's moving parts; blowers are electrical devices and should be treated as a source of combustion. Don't put flammable materials anywhere near the motor, the shaft or the intake -- preferably, they should be banned from the blower room altogether. A church fire is not worth the convenience of storing a few cans of oil. 4) The blower room should be locked or off-limits for unauthorized personnel. Another anecdote -- the blower room was used as storage for the choir's music. The blower was not shielded in any way, and the lady who was responsible for selecting the music was down in the blower room when the organ was on. She inadvertently got too close the the blower and her skirt was caught by the blower shaft coupling, rotating at over 1300 revolutions per minute (that's 21 rotations every second). It pulled her into the space between the motor and the blower turbine. Her injuries were horrific -- and completely unnecessary. Most churches would not allow lay personnel to work in the vicinity of air conditioning or heating equipment, and the blower should not be treated differently. If the blower must be in an accessible location, the blower should be caged to prevent blockage of the intake, or access to the motor and shaft area. Of course, it must also be accessible for regular maintenance, so it's enclosure must be removable for that purpose.